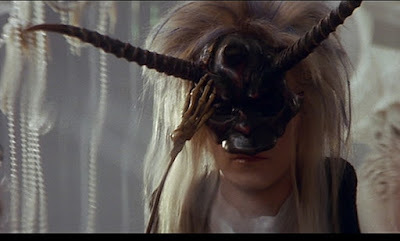 My original Jareth mask has long since been sold, but I have had the mask up on a made to order basis on Etsy for awhile now. I get a huge amount of inquiries about how long it would take to have one made, but over the past few years I've been super busy and not really into the swing of things creatively. I've often shut down offers for a commission on one. Crazy, I know, but when you're not feeling it, you're not feeling it. There was one person however, who was very adamant about getting a mask done. There was one hitch however in that they wanted a mask that was more accurate to the one in the movie, with that boney arm stick holder. At first I was a bit apprehensive as I know the original mask weighed more than I thought a stick could handle. I also wasn't sure how to securely attach a stick to a mask that has weight to it or what to use for a stick even! I decided I'd try to make the mask as light as I could, which proved difficult using the methods I prefer to create with. Still, I used thin layers of plasterwrap to keep the weight down as much as I could. I had to make a new horn mold because I misplaced the original one somehow. 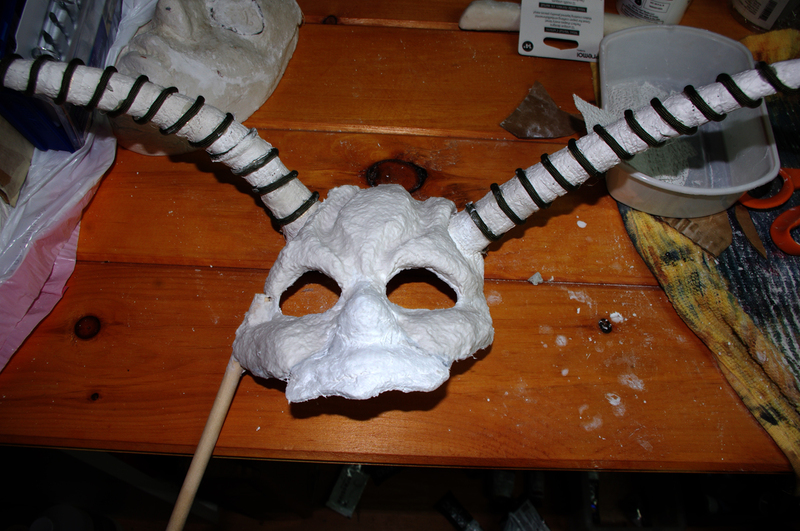 I was able to make the horn a lot thinner this time which was pretty cool not only for weight but accuracy. I also tried a new sculpting compound for forming the shape on the mask, called Amaco Sculptamold. I can't say it was any easier to work with and it certainly came out just as lumpy as the Celluclay normally does. I have lots of sanding work to do on this one. I really need to find something entirely new that doesn't weigh a ton. I have tried Apoxie-Sculpt in the past year and it weighs a lot as well. All polymer clays weigh too much and paper clay always tends to crack on me. Totally open to all suggestions here! In its current state, it's a lumpy mess, but the gesso + sanding will help that out. It would sure be nice to be able to skip that whole series of steps though. I attached the stick to the side of the mask first with hot glue and then further attached it with the modeling compound. I am likely going to go over it again with some plasterwrap cloth pieces to ensure it sticks. I'm very nervous about it falling off. I searched for a ton of tutorials and could only find how to attach sticks to tiny little fabric masks, not something that weighs a pound or more. I also opted for a thicker dowel instead of the thin one which would have looked better. I'd rather play it safe than sorry though and until I can get the weight down, it's just going to have to be this way! Thanks for Reading and Happy Creating! If you found this post helpful please share it with your friends! I also love a comment! You can get up to the minute updates by following me on Facebook by clicking here. Marie Messina is an artist, maskmaker, and blogger. "Working with My Hands" chronicles her experiences while learning to make masks of all shapes and sizes. 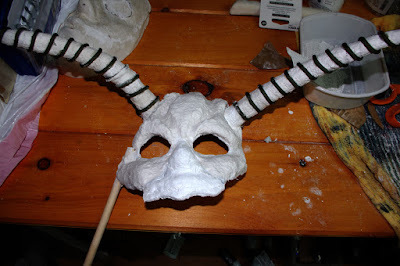 This blog should address the questions of new mask makers (or just people who are interested) by offering tutorials and explanations of materials and methods used. Marie hopes to share with her readers the fruits of her labor while working towards mastery in mask making. Subscribe to my mailing list by entering your email so you can receive my monthly newsletter! Copyright Marie Messina. All Rights Reserved. Awesome Inc. theme. Powered by Blogger.